I have just released version 4.0 of STG FolderPrint Plus. – The PDF export system was completely replaced, and if you ever used it, you will notice the difference right away, because it is much, much faster than the old one. You also have a Export to PDF button and menu item on the Preview. 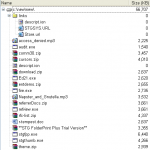 – Preview inside ZIP files. If you are always looking into compressed files and opening them to preview a single file, you'll like this one. I wrote a full post about it. As usual (for my programs, that is), this a free upgrade for all users, and your old key will just work. STG Folder Print Plus 2.60 (Win XP SP3, 32bit) is scan, if char in name folder or file is ? (U+2588), then isn´t found. As is it STG Folder Print Plus 4.0? STG FolderPrint Plus 4.0 does not support Unicode, so scanning folders with Unicode only characters will fail (they will appear with a ? in place of unicode characters and empty). Files with unicode names display with the same problem, but show all regular file information (date, sizes, etc). I don’t believe there is any way to change that without full unicode support, which is on the to-do list but is a rather large project. No ? but char – (U+2588 = to me special char (full block = optic warning) for indicate folder or file in NAS harddisk. No char (U+2588) to folder / file backup medium (CD, DVD, BLU-Ray), if folder / file ist char (U+2588) to end name (on sorting), then no backup folder / file. All in STG Folder Print Plus 2.60, in 4.0 is ? a correct visible file and info (size, …)? Thanks for answer and speed. Is tested STG Folder Print Plus 4.0 … is same problem. Is place char = – no problem. Problem is blocked in folder with name char (U+2588) and no size etc. File is no (char name) location = invisible.